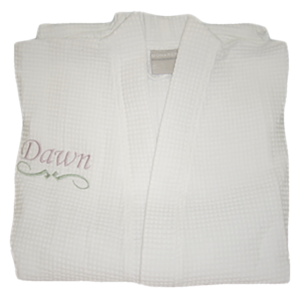 Robes Ankle Unlined Waffle: -Personalized summer robes, monogrammed summer robes, Personalized gifts, monogrammed gifts. Personalized summer robes, monogrammed Summer robes, Personalized gifts, monogrammed gifts, embroidered gifts, embroidered summer robes, keepsake gifts, Summer robes, terry velour robes, terry cloth robes, Ladies robes, Women robes, terry robes, waffle robes, waffle terry shawl robes, waffle terry robes, terry velour shawl robes, personalized robes, monogrammed robes, Embroidered robes. Unique, Personalized & Custom Gifts for every occassion! Lets face it - not every one likes too much warmth even during winter. Here's a nice compromise. This unlined kimono waffle robe is a perfect 70/30 Cotton/poly blend. The generous 48" length will reach you a bit above the ankle and certainly well below the knee. Remember, letters are embroidered in the order you specify. You can monogram full names or sayings.